Hitting a baseball is most definitely a skill. With deception in the ball’s delivery, the variance in rates of speed from pitch to pitch, and the cartoon-like movement that some hurlers can put on the baseball, it should also be considered a difficult skill. And if the task of simply making contact were not enough for the hitter, know that producing certain results in a laundry list of situations takes this skill to another level. The team needs hitters to hit behind runners to move them over, lift fly balls into the outfield with less than two outs and a runner at third base, and do not forget to cover everything in the pitcher’s arsenal whenever the count gets to two strikes. Situations are a part of the game of baseball, and producing results in those moments demands situational hitting. 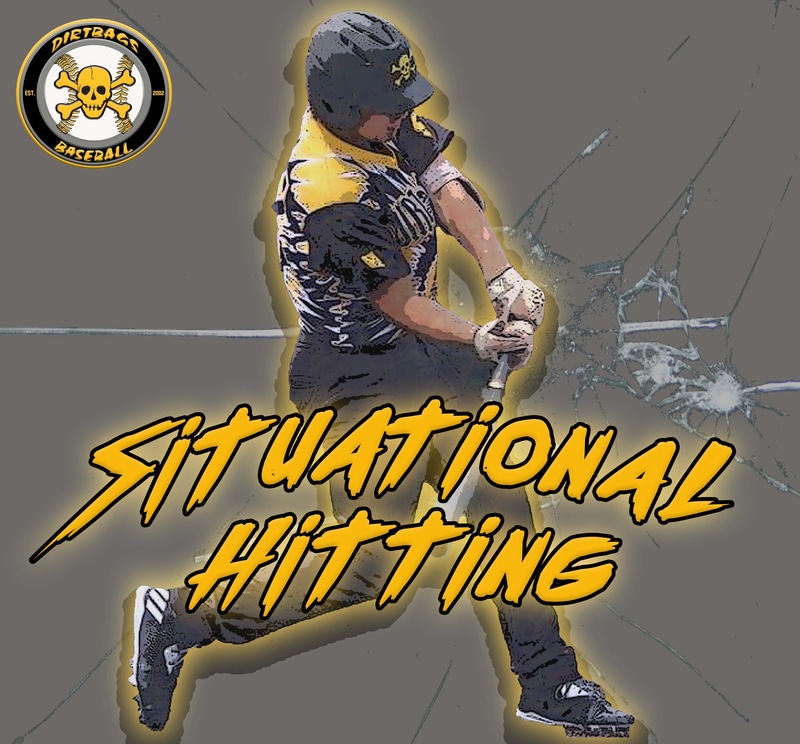 Thus the skill of situational hitting needs to be practiced be able to be executed consistently. While some hitter appear to be more situationally comfortable than others, understand that having a sound swing to strike the ball is required before attempting to navigate the many scenarios a hitter may need to answer in the box. Recognize a few physical components do exist to make this achievable. The swing needed handle situations across a broad scope must be short. Accomplishing a short stroke can be aided by decisions on the grip, the stance, hand positioning and even the trigger/load. The short swing provides more opportunity to contact balls in different parts of the strike zone. Conversely, the big, long swing may produce more power and lift, but it demands the hitter to know how to stay away from certain pitches. The shorter, quicker swing gives access more locations in which balls can be attacked. With a swing that can handle more locations in the zone (inside, middle, away), the mental components to situational hitting then becomes the focus. Hitters that know what to expect from a pitcher by paying attention prosper most. Also, knowing which pitches to look for to produce results allow the hitter to hunt pitches to execute those situational outcomes. The right handed hitter who needs to move the runner over with a ball to the right side should look away. The situation with a runner at third base and less than two outs calls for the hitter to look up to lift a ball to the outfield. Each situation may have multiple answers to produce a result that aids the team and certainly a hard hit ball no matter its destination can be a quality at-bat. Perhaps the bottom line is to be aware and recognize what the situation needs in order to put the team in a position to succeed. Consider a few drills to improve situational hitting performance. Tee work … Tons of options to consider for this, but the focus should be to hit the ball in various places in the zone with the same swing. By that, the ball location of IN, MIDDLE, or AWAY demands contact at different depths of the ball in relation to the plate. Balls “in” are contacted out in front. “Middle” balls are contacted on the front of the plate. And balls “away” are hit deeper as they have traveled to the catcher. As such, the ball as it travels off the tee should correspond directionally to being squared on the barrel – pull the IN ball, the MIDDLE ball through the middle, and the AWAY ball is hit to the opposite field. Quality reps on this portion of swing development are critical to building a short swing that can respond to situational demands. Cage work … Whether cage work is front toss or overhand BP from a longer distance, the need is to replicate the same locational variations that were addressed on the tee. Other “game” situations can be added also. This is a great place to work on a two strike approach (another big time situation). Practice making physical adjustments of plate coverage and choking the bat to minimize the holes the pitcher can attack with two strikes. Garnering an approach to the many situations a hitter will face in the game while in the cage provides more reps in a shorter period of time. Team BP … This is where the hitter can hopefully begin to understand the work they have logged will start to produce results. Having a semblance of a defense and spatial awareness of the field can let the hitter “see” if the balls they are hitting can produce desired outcomes in those situations. Having a round of BP in which a certain situation is the primary focus is optimal. Better still is to have base runners simulate reads on balls as the situations are being announced for execution (“Runners at 1B – move them with a ball to right side … runners at 3B score them with a fly ball or a ground ball in the middle”). These types of scenarios allows the hitter to look for those offerings that will give them the best opportunity to execute the desired outcome. The variety of scenarios and the multiplicity of several groups working on situational skills make these drills valuable beyond compare. Best of luck to all the hitters as the spring approaches. Here’s hoping you are able to come up big in those big situations. Know the best way to do that is to prepare for them!